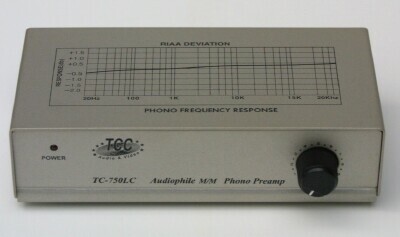 We took our tried and true TC-750 and added an output level control to create the PERFECT preamp for use with computer sound cards. 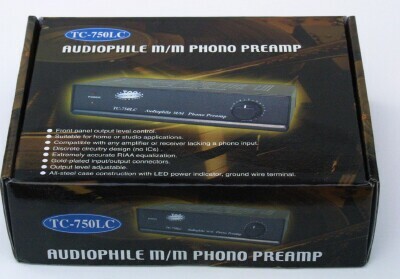 The adjustable output allows correct setting of recording levels, something you may find your burning software and / or sound card driver has insufficient range to permit. 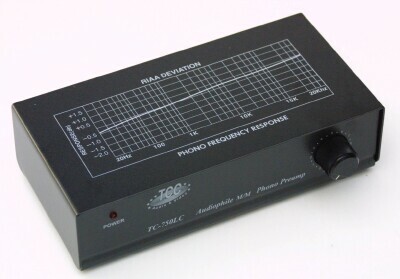 When used with a stereo, the control allows the phono source level to be set to match other inputs such as CD or video, so that switching between sources requires little or no change in the stereo's volume control setting. Now available in SILVER or BLACK! If connecting to a computer, simply substitute it in the diagram for the amplifier shown below. Use the sound card's LINE INPUT jack, NOT the MIC IN. 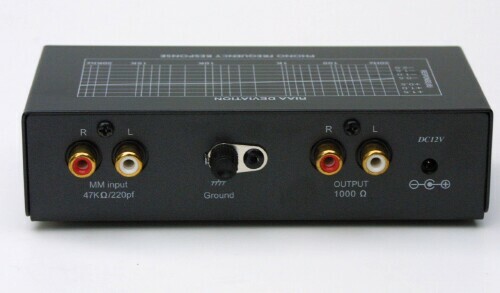 Any of the following labelled amplifier/receiver/minisystem input jacks can be used; AUX, TAPE IN/PLAY, LINE IN, CD, TUNER, MD (MiniDisc), VIDEO or DVD (use the L&R AUDIO jacks so labelled; ignore the actual yellow VIDEO jack if present). and a mini-plug adaptor (to use with computers). The AC adaptor is also included. First choose a payment method by clicking on a logo. Your transaction is then completed on the payment processor's secure website. Because NO personal or payment info is entered here, your online purchase is as secure as possible. Authorize.net and Paypal are both happy to accept any major credit card. Both provide immediate online and email payment verification; tracking and customs form information is provided when we ship to you (most orders are sent same or next business day).